Fri., Nov. 14, 2014, 12:01 p.m. ENDANGERED SPECIES -- Conservation groups announced today a $15,000 reward for information that helps convict a poacher who killed a federally protected wolf near Salmon la Sac. U.S. Fish and Wildlife officials confirmed this week that a female gray wolf from the Teanaway pack in Upper Kittitas County died last month from being shot. The public is being asked to report any information or sightings from Oct. ​17 to Oct. 28 dealing with the case. Information can be reported by phone at (425) 883-8122. Tips also can be reported on the Washington Department of Fish and Wildlife recorded poacher hotline, (877) 933-9847. Groups contributing to the reward include Conservation Northwest, the Center for Biological Diversity, Defenders of Wildlife, Woodland Park Zoo and the Humane Society of the United States. After a wolf from the Smackout Pack was found dead Feb. 9 near Cedar Lake in northeast Stevens County, conservation groups joined with the Washington Department of Fish and Wildlife to offer a $22,500 reward for information about the case. However, the case still has not been solved. The investigation continues into the October shooting of a wolf in Whitman County. Twisp ranching family members were ordered to pay fines totaling $50,000 in 2012 for killing two Lookout Pack wolves in 2008. The carcass of the breeding female recovered Oct. 28 in the Teanaway Pack’s habitat area was found on the north side of the Paris Creek drainage in the Salmon la Sac area north of Lake Cle Elum, says Brent Lawrence with the U.S. Fish and Wildlife Service in Portland. The area is within the Okanogan-Wenatchee National Forest. The person who killed the Teanaway wolf could set back state de-listing of wolves from endangered species protections. Washington's wolf management plan sets a goal of having wolf packs in three areas of the state. 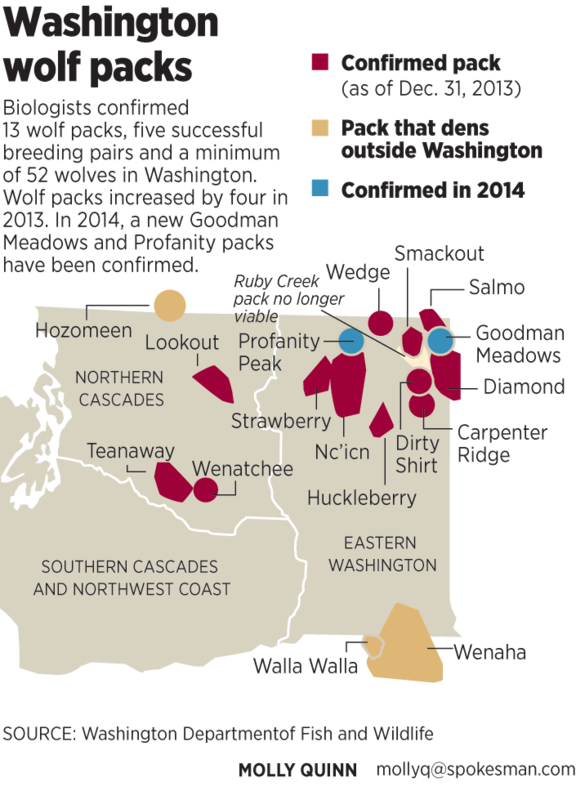 The Teanaway Pack ranges very close to the last of the three zones — the southern Cascades — which is still unoccupied. Wolves ranging out of that pack could be the ticket to de-listing. The wolf was fitted with a radio telemetry collar and was recovered by federal wildlife officials and those with the state Department of Fish and Wildlife. Gray wolves in the western two-thirds of the state (with U.S. Highway 97 the boundary) are protected by the federal Endangered Species Act and a similar state law, Lawrence said. The Teanaway River valley and the area north of Lake Cle Elum is in the part of the state where wolves continue to be under both state and federal protection. East of the highway, wolves have been taken off the federal endangered list but continue to be protected by state law. The federal agency is the lead investigator of wolf mortalities in the western two-thirds of the state. Lawrence said the wolf’s telemetry collar signaled that it wasn’t moving, which led to the search and recovery of the carcass. The preliminary necropsy revealed the wolf was shot in the hindquarters. He had no additional information to share about the investigation or a possible suspect.